International award-winning filmmaker and best-selling author T.C. Mcluhan visited the MET Mumbai and Nashik campuses on 18th January, 2014. 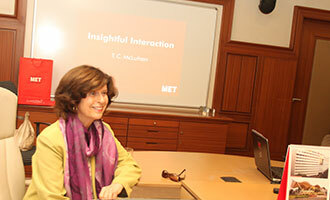 During her trip she had an insightful interaction with the MET faculty and staff. There was an interactive Q & A session between T.C. Mcluhan and METizens about her documentary film - The Frontier Gandhi: Badshah Khan, a Torch for Peace, which took her 20 years to complete. She delightfully shared her experiences with the audience. The film has already seen incredible success, having won the best documentary award at the Middle East International Film Festival in Abu Dhabi. She was most impressed with MET’s infrastructure facilities during the campus tour.